Let’s propose a hypothetical scenario: you just moved into the apartments near Platt Park, and you’re wondering what’s the deal with that Larimer Square area, or, alternatively, you’re a longtime Denver resident who just hasn’t made their way over there yet and you want to know what all the buzz is about. Either way, we’ve got the details you need, so join us, as we teach you a few things you may not have known about popular Larimer Square. Larimer Square is one of the oldest commercial blocks in the city, and the street where, as many claim, Denver truly began. You can take a peek at some of the highlights of this historic stretch of road on the official Larimer Square history page, but let’s see if we can break down the most important details from the past for you here. We’ve got to travel back to 1858 to get to the beginnings of this block, when William H. Larimer Jr. first founded the City of Denver and built Larimer Street in his name. Commerce quickly drew to the area, and even after a colossal fire occured in 1863, important Denver businesses (like the Rocky Mountain News) flocked to the area, creating a boom that lasted through the 1870s. In fact, many of the historic buildings you see in Larimer Square today were constructed in the 1870s and 1880s, the oldest of which is the Kettle Building, which was built in 1873 as a butcher shop run by one George Kettle. Unfortunately, Larimer Street began to experience a decline in the 1880s, when the balance of commercial power in the city began to shift. Roads like Sixteenth and Seventeenth Streets saw their own ascension to greatness begin, with banks, hotels shopping centers, and entertainment venues popping up regularly, and while Larimer Street stayed in contention for prominence until the early 1890s, the Panic of 1893 saw that all come tumbling down. Economic catastrophe gripped the city, and even after Denver started to climb out of the decline, Larimer Street was left behind, developing a reputation as a Skid Row in the early half of the 20th Century — home to low-rent buildings, bars, pawn shops, and liquor stores aplenty. In the second half of the 20th Century, however, work began to stave off the decline and bring Larimer Square back to prominence. 1958 saw the commissioning of the Denver Urban Renewal Authority, and their Skyline Urban Renewal Project, designed to redevelop dilapidated streets throughout the city. At the same time, one Dana Crawford happened to “rediscover” Larimer Street and its history, and through the efforts of the Larimer Square Associates, and the renewal mission, at least on Larimer Street, shifted from demolition and rebuilding to preservation and renewal. Which leads to the present day. Now, Larimer Square is the “best-preserved block of nineteenth-century buildings in downtown Denver.” You’ll find plenty of old structures from centuries past here, like the Miller Building (once a legendary saloon) or Lincoln Hall (a former dance hall). You can find a more complete listing in the buildings section of Larimer Square’s official site, and you may well learn more about the history about the birthplace of Mile High City. Nowadays, Larimer Square plays home to a number of restaurants, bars, and stores. They’re too numerous to list them all here, but we’ve plucked one representative from each category to showcase what this historic part of the city has now become. Located at 1422 Larimer Street, this meatlover’s paradise “retains the lively feel of the Colorado West,” complete with a “turn-of-the-last century bar highlights a slew of architectural remnants from Denver’s past.” You can enjoy your favorite American-style dishes, from downhome barbecued meats to delicious and sumptuous side dishes, all under the direction of head chef Frank Bonanno. If you like wine, you’ll love Cru, the lovely establishment, also at 1442 Larimer Street, that features more than 300 wines on its menu and approximately “40 premium selections available by the glass.” Flavors and textures abound here, and you can pair that great glass of wine with some small food plates to accentuate your experience. There’s nothing quite like an old-school hat shop, and you can find one at 1410 Larimer Square, in the form of Goorin Brothers, an 1895-original now in its fourth generation of family-leadership. All kinds of hats for both women and men are here for you to peruse, and perhaps even purchase, even those with a decidedly contemporary flair to them. Want to See Larimer Square in All Its Glory? So, you want to check out Larimer Square for yourself? Then block off some time in your schedule and head on down there! There’s plenty to explore, and you’re likely to find more than a few establishments you’ll fall in love with. 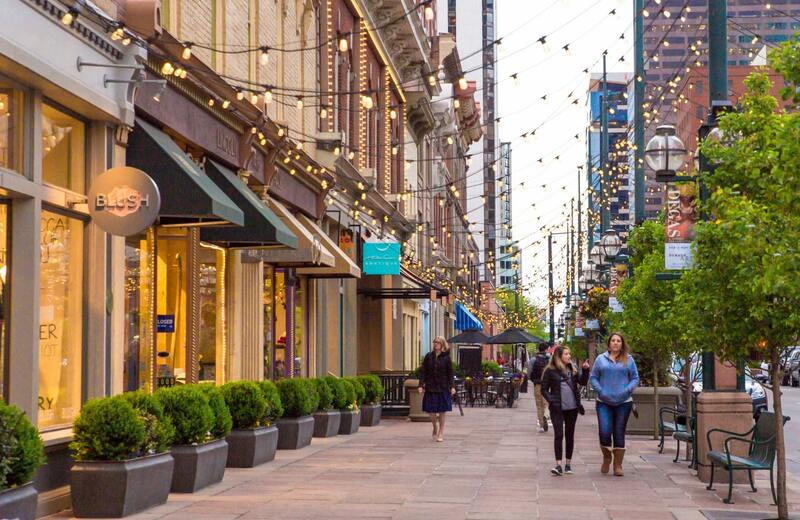 Of course, if you’re looking for a more guided experience, you can also take one of the Larimer Square Walking Tours, which will also provide some historical context for you to take in as you view this timeless part of the city. Either way, the experience is going to be an exciting one, so prepare to have some fun. Here’s another thing you probably didn’t know: Larimer Square is just a cool, ten-minute drive from the most popular apartments in Platt Park — The Henry. For enjoying the wonders of the city and all the hip, hustle & bustle that Denver has to offer, few apartments can do it better, so why not take a look for yourself and see what kind of life you could be living here in the Mile High City?